Join us for our 4th Annual Johnston Jaguar Jungle Run 5K and 1 Mile Prowl. Dress up as your favorite jungle animal and race with the pack on the wild campus of River Ridge High School and Mill Creek Middle School. All proceeds go towards educational resources in the JES classrooms as well as supporting our physical education, art, music and library programs. Our school has done it again! Johnston is proud to be a 2017 Govenor's SHAPE Honor Roll Platinum Recipient for a second year in a row. Johnston was the only elementary school in Cherokee County to earn the Alliance for a Healthier Generation National Healthy Schools Bronze award this year too! Johnston Elementary School was recognized as the 2015 Governor’s SHAPE Honor Roll Gold Recipient as well as the 2015 American Heart Association Platinum Fit Friendly Recipient in the past. We are still proud to have been the 1st school in Cherokee County to receive this award. With your help Johnston Elementary School will continue to promote healthier life styles for our students and families here in Woodstock. Why participate in the Jungle Run or Prowl? Johnston Elementary School is one of 30 schools in the state of Georgia and the only school in Cherokee County to earn the Alliance for a Healthier Generation National Healthy Schools Bronze Award. We have also earned Platinum for the 2017 Govenor's SHAPE Honor Roll Award. Last year we earned the same award and the year prior we were the 2015 Governor’s SHAPE Honor Roll Gold Recipient as well as the 2015 American Heart Association Platinum Fit Friendly Recipient. We were proud to be the 1st school in Cherokee County to receive this award. Our school continues to be led by Coach Philpot and Coach L'Esperance with the Power Up for 30 Program. With your help Johnston Elementary School will continue to promote healthier life styles for our students and families here in Woodstock. Read more about the history of our school and the grant we received three years ago to help us build our track. This track is enjoyed daily by our students, staff and community. Florine Dial Johnston Elementary School was constructed in 1980 on land donated by the Florine & Smith L. Johnston family of Woodstock. Mrs. Johnston was a lifelong resident of Woodstock and had served as a teacher for a lengthy career within the community. Following her death in 1979, the Cherokee County School District agreed to name the school on her family land in her memory. Devoted to family and students, Mrs. Johnston continually sought out efforts to encourage more family interaction and provide better amenities and services for her neighbors. She was a founding member of the Woodstock Garden Club, assisted in starting the South Cherokee Recreation Association, assisted in the start of the first Woodstock Library, and worked in the Woodstock Community House to see more family events and activities planned in Woodstock. This upcoming year marks the 35th Anniversary of the construction of Johnston Elementary School and the school leadership is working to prepare a vision similar to Mrs. Johnston: bringing families and the community together to spend quality time and develop memories within the community that will last for future generations. One of the signature projects that is part of this vision is the development of a quarter-mile walking track around the large field behind the school. There is currently a wheelchair ramp to the site making it accessible and the track-site is accessible during evening and weekend hours. 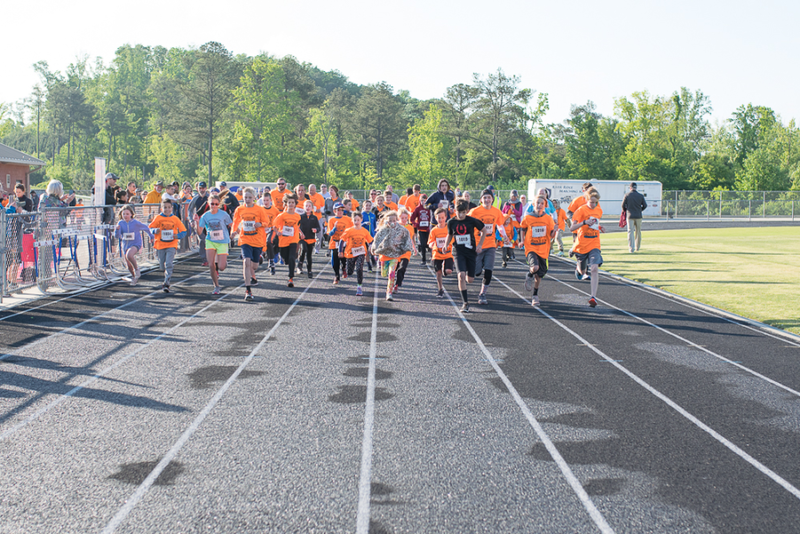 We feel that a walking track will promote health and wellness, create opportunities for students and parents to exercise and talk together, and will give our students a very important link to our school’s namesake. 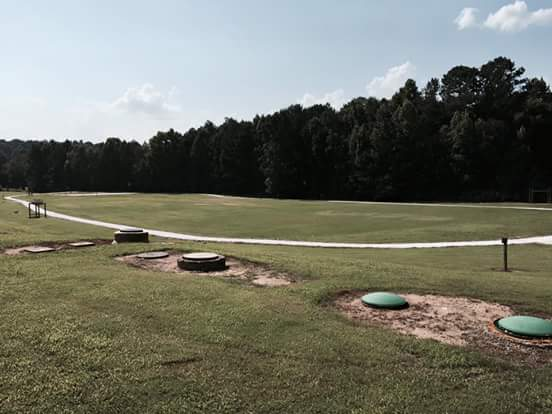 The quarter-mile track will be used by Physical Education Classes, as part of School Events, and will benefit the local community, as there is not a walking track similar to this project in the North Woodstock and East Cherokee Area. Long walks with family promote communication, exercise and quality time. Proceeds from this event have gone towards a walking track, covered section and landscape around the track for outdoor learning. This year all proceeds will go directly towards teacher grants as well as the PE, Art, Music and Media Center Programs. 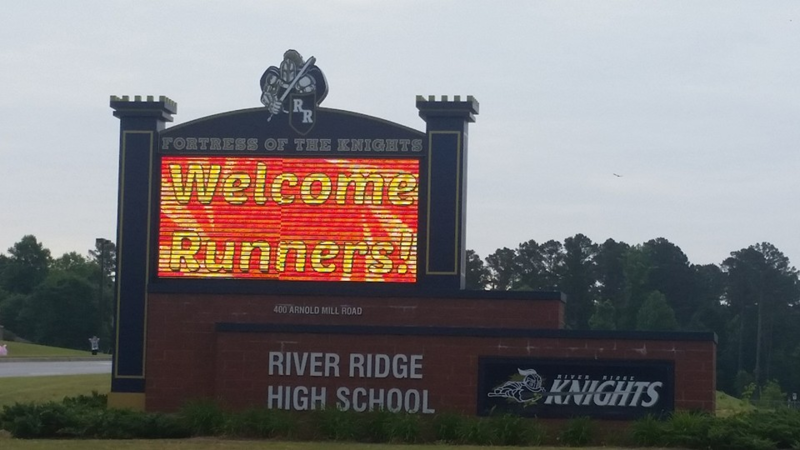 Enjoy our fun and flat course on the River Ridge High School and Mill Creek Middle School Campus. Parking is available behind River Ridge High School. Please note that the main campus entrance off of Arnold Mill Road will be blocked off due to race preparations. Please use the next entrance that is west of the main entrance closer to the high school and stadium. Restrooms are also available near start and finish lines. Awards will be given to the top overall male and female winners in both the 5K and 1 Mile Prowl! Then top male and female in 5-9, 10-14, 15-19, 20-29, 30-39, 40-49, 50+ age groups will receive awards. All 1 Mile Prowl participants will receive a ribbon. Prizes for various jungle themed costumes will also be handed out. Snacks, drinks, music and fun will follow the races. Race photos will be uploaded soon.